Are you looking for unique ways to dress up your daughter for her birthday party? Is her special day coming soon? Remember every little girl dreams about an extravagant party and looking fancy at her party. Maybe she is dreaming of being a real princess for a day. Maybe she wants to dress exactly like her favorite Disney character – Rapunzel, or maybe she wants to wear something super cool and have fun with her friends. Let your little girl choose and wear something exclusive! Be creative with DIY accessories! You have already purchased the cutest outfit for your little girl’s birthday party, but you want her to look unique and stand out. Head over to Pinterest and start a board with DIY accessories. Pinterest offers many DIY projects to create fancy headbands, flower crowns, bold necklaces or bows. Think outside the box and get inspired by piecing together different ideas. If you are celebrating your baby’s first birthday, her first birthday outfit must be something remarkable that you will still remember when she grows up. For instance, if your little girl turns one year old, you can create an adorable baby’s 1st birthday outfit! Create your tutu and pair with a cute little T-shirt. Add a DIY beaded necklace to finish this stylish look. You can also create unique accessories for your guests or with your guests. Set up an arts and crafts station during the party to make DIY accessories, it will be the perfect game and set for birthday pictures. Don’t be afraid to play with patterns and colors! Your baby is a big girl now. She is somewhere from 5 to 10 years old. She is grown up and probably wants to have a birthday party with her best friends from school. It is her first birthday party with friends, let her wear whatever she wants and have fun with her buddies. In this case, she can wear something casual, funky, and most importantly comfortable. It will be so much joy to plan your little one’s birthday party together. You can browse online to find a birthday theme and a bold outfit to match. Fashion tip! – Pair a pattern or printed dress with a bright color accessory to create a truly stylish look. If you want to make your little girl’s birthday outfit extraordinary, you can mix and match colors and prints by layering. She will 100% look like the number one fashionista in her class. Most importantly, match her birthday dress or outfit with her personality, and respect her decisions; she is old enough to make her choices! After all, it is the only time of the year when it should be all about her. “Disney Bound” aka Contemporary Dress-up! Your little girl wants to look like a princess. You are debating, and thinking of a unique way to dress up your precious girl like a princess for her special day. Try dressing her up like a Disney princess in a subtle way. This idea is called Disney Bound. Disney Bound is a big fashion trend where Disney fans create modern, fashionable outfits inspired by their favorite Disney characters. The classic princess dress transforms into a contemporary outfit. You can create your little girl’s birthday outfit from shopping at any clothing store. Remember to be creative and grab other clothing pieces from her closet. It is an easy way to dress her up with the latest fashion trends inspired by the Disney princesses. Is Queen Elsa your little girl’s favorite character? You might want to look for a blue flower girl dress made of light tulle or organza. Accessorize with a lot of sparkles and glitters, with hair clips, necklaces, bracelets and glitter spray. Voila, you will have the happiest Elsa in front of you! 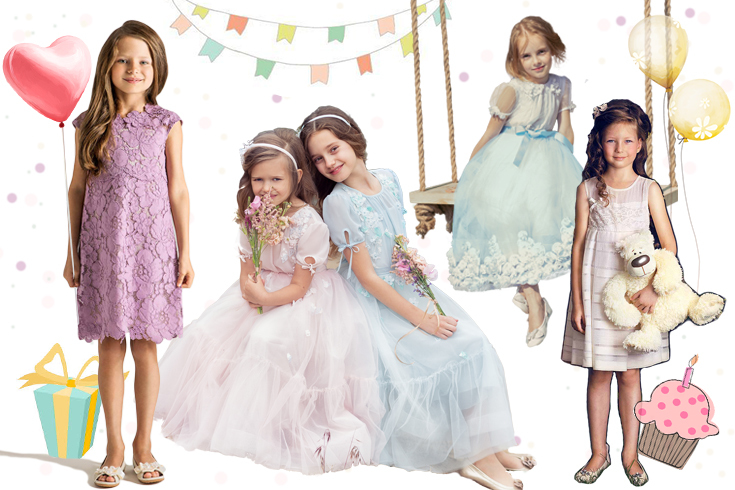 If your little girl wants a simple and comfortable look, dress her up like Rapunzel with a lace lavender dress. Finish the look with a beautiful braided hairstyle and real flowers. Whatever you and your baby girl decide, let her be the star of the show and celebrate in style. Remember to style your little girl comfortably and around her personality. And do not forget to take lots of birthday pictures! Have fun and get your creative juices working!